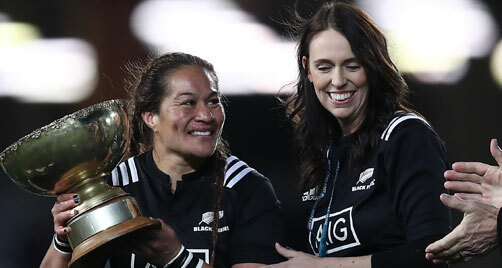 (Report - NZRU) Securing their forward dominance, the Black Ferns were able to unleash their backline skills with effect to complete successive wins over Australia when securing the Laurie O'Reilly Memorial Trophy 45–17 at Eden Park. Coach Glenn Moore said the performance had been pleasing and while most of the action came in the second half that was down to needing to build up pressure earlier in the game. "We wanted to take it to them up front. We thought they were a wee bit suspect at times around the edges and we had done a lot of work this week getting latches and we scored tries off that," he said. At halftime the talk was about getting the ball to the outsides once the Australians had been committed in tight. "I think the pleasing part was that some of the things we worked on around their jamming defence we certainly got around them," he said. The future would be about continuing to build their game to achieve the style they wanted to play. It wasn't just one style. "We've got a new look team with a number of new faces and it's going to take a little bit of time to build that confidence and we're well aware of that but we were better this week and I'm confident we'll be better next time as well," he said. Prop Aldora Itunu was taken to hospital after the game but Moore said he understand she was not badly injured. She had been a powerful contributor to the side but he was also pleased that all of the props in the squad had played well. Captain Fiao'o Faamausili said the side appreciated being able to play on New Zealand's major rugby grounds. "Every Test we do get on big grounds is awesome for us. To have a fixture alongside the All Blacks today, all the girls are excited, especially at a home turf where your family and friends can be present," she said. With the players going back to their provinces to play Farah Palmer Cup games and with their contracts coming into effect the game was heading in the right direction, she said. Moore said the side's two Test matches in France in November would be stand-alone games and in a recent stand-alone game between France and England a crowd of 20,000 had attended and French officials were confident they would have good attendances for the Black Ferns games and the New Zealanders were excited about that.